Today (Tuesday) marked the fifth time Sheila Paquette has traveled from her home in western Massachusetts to Cape Cod to seek justice in the alleged assault of her brother, John Burns, an intellectually disabled resident of a group home in West Springfield. But Paquette learned today she will have to make yet another trip to the Cape, along with David V., another resident of Burns’ group home, and Dan Aguda, a Department of Developmental Services instructor. The three were scheduled to testify today in Falmouth District Court in the trial of John Saunders, a former resident of Burns’ group home, who is charged with assaulting Burns during an outing on the Cape in June 2010. As Paquette and the others sat in the courtroom all morning on Tuesday waiting for the proceedings to finally begin, the judge at the last moment postponed the trial until June 4 because a defense witness had failed to appear. Paquette, who is president of the Advocacy Network, a COFAR member organization, was visibly shaken by the sudden decision. Sheila Paquette (left) in front of Falmouth District Court Tuesday after the trial of the man accused of assaulting her brother, John Burns, was postponed yet again. 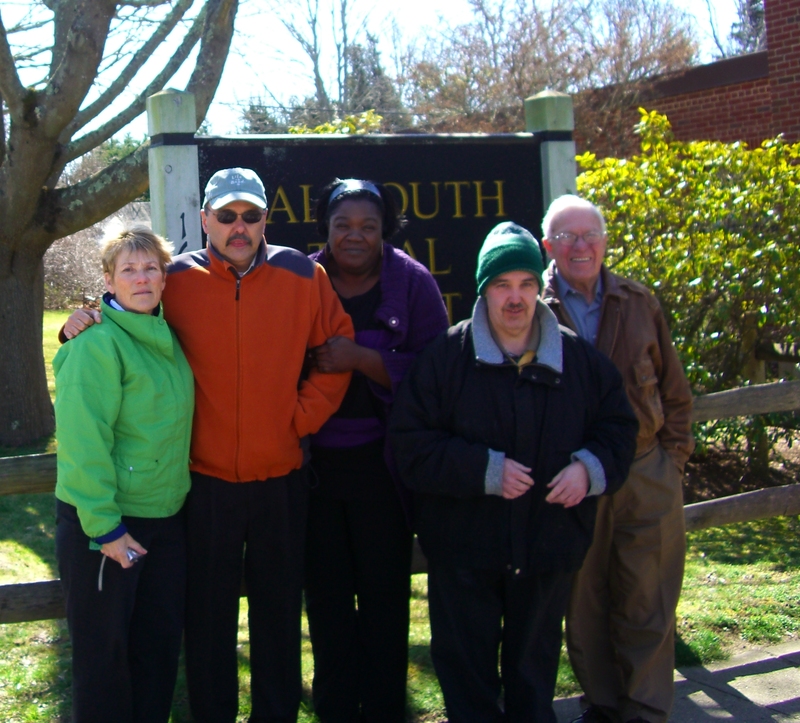 To Paquette's right are Dan Aguda, a DDS instructor in John Burns' day program; Deborah Reid, the house manager in Burns' group home; David V., a resident of the group home; and Ed Strout, a Board member of the Advocacy Network, a COFAR member organization. Whalen tried to reassure them and said she believes the trial will go forward on June 4. The judge, she said, will not grant another continuance to the defense witness. Paquette isn’t convinced of that, but she and the other prosecution witnesses are prepared to travel to Falmouth again in June. “Anyone who assaults the intellectually disabled should know that these cases will be pursued,” she said. The last time Paquette and the group from western Massachusetts were in court on the Cape was January 9, when Saunders’ trial was first scheduled. But Saunders himself was a no-show that day. Saunders was reportedly arrested by police a couple of days after the January trial date and was released after posting bond that had been set by the judge at $1,000. The Falmouth District Attorney’s Office stated that it had requested a $5,000 bond for Saunders. He was present in the courtroom on Tuesday. Paquette personally filed assault charges against Saunders in July 2010 after she became frustrated with the slow pace of state and law enforcement authorities in investigating the case. The Center for Human Development, a nonprofit firm that contracts with the state Department of Developmental Services to operate the group home in which Saunders worked, subsequently fired Saunders. Saunders allegedly hit Burns in the face while toileting him during a vacation outing on the Cape for residents of the group home. Burns suffered two black eyes and other injuries. In recent months, Burns has been confined to a wheelchair. Paquette says she was told by her brother’s neurologist he has a neck injury typical of serious whiplash. Saunders has denied assaulting Burns. The Disabled Persons Protection Commission concluded there was reasonable cause to believe Saunders had used excessive force and had physically assaulted Burns. The DPPC also recommended that Saunders no longer be permitted to work with DDS clients and cited the CHD group home for failing to identify Burns’ injuries before sending him to his day program the morning after the alleged assault. Are they really cutting that program? “I want to shake you all,” the woman said through an interpreter. It was a plea to the impassive panel before her of members of the House and Senate Ways and Means Committees, none of whom could really have more than an inkling of what it must be like to live, as this person does, with both deafness and blindness. I didn’t catch the name of the woman, who testified at a hearing on the state budget in Gardner auditorium at the State House on March 9. But her message was clear. She wanted to stop the yearly cycle of budget cuts that continually threaten her lifeline to the outside world. Specifically, she was referring to the proposed elimination in Governor Patrick’s Fiscal Year 2013 budget of $450,000 for a program to provide her and other deaf and blind people with community-based support services. Yes, $450,000 for a program to provide interpreters and other assistance in daily living to people who are both deaf and blind. It’s apparently something this administration can’t bring itself to support, despite its claim to be a pioneer in developing community-based services for the disabled. But even if the Legislature restores the $450,000, the promise of “Community First” will be far from realized, even for the estimated 500 people in the state who are both deaf and blind. Chris Emory, a member of the deaf-blind community, maintained that the program in question is able to provide services for only about 70 of those people. 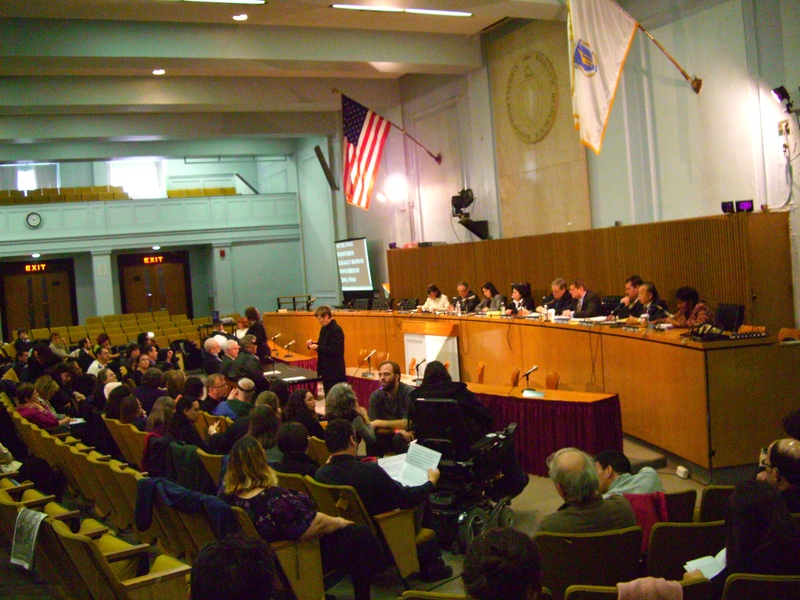 Also testifying at the March 9 hearing was David Berkeley, who urged that the Legislature add $7 million in funding for “clubhouses” that provide a range of community services to people with mental illness. Berkley said the program, which has been level-funded by the governor and Legislature for the past 12 years, has kept him from needing hospitalizations for his own disability. Before he received help from the program, he had been hospitalized more than 50 times over an 11-year period, at a total cost of $750,000. Reva Stein, executive director of the Massachusetts Clubhouse Coalition, said the flat funding for the program has, in effect, amounted to a budget cut because the clubhouses serve 1,200 more people than they did just seven years ago. The Clubhouses offer a wide range of services to the mentally ill, including job training, employment placement, benefit counseling, housing support, homeless prevention, and social opportunities, according to a Coalition fact sheet. According to testimony at the hearing, the governor’s budget would provide additional funding to the Department of Mental Health for residential services, but the money would be earmarked only for people being transferred from Taunton State Hospital, which has been targeted by the administration for closure. Similarly, the governor’s budget provides additional funding for community residential services for intellectually disabled people being transferred from four developmental centers targeted for closure. Other community-based programs would be level-funded or cut, however. I delivered testimony to the Ways and Means panel on behalf of COFAR that time is running out on the Fernald, Templeton, Monson, and Glavin developmental centers. The number of residents left in them has been reduced from roughly 475 in 2008 — when the administration first announced they would be closed — to about 165 today. Yet, no independent cost analysis has ever been done of the closures of those facilities. It so happens that a bill (H. 3964) requiring such an independent analysis of the costs of closing three of the developmental centers — Templeton, Monson, and Glavin — is currently before the House Ways and Means Committee. The bill was sent to the committee last month after having sat in the Children, Families, and Persons with Disabilities Committee for more than a year. These developmental centers provide a safety net for a small segment of the state’s intellectually disabled population that cannot function successfully in community-based group homes. Even the Association of Developmental Disabilities Providers, which represents state contractors that operate the group homes, acknowledges that the closures of the developmental centers have so far not produced promised fiscal benefits to the community-based system of care. I said all of this to the members of the House and Senate Ways and Means panel. They listened impassively, as they had to everyone else. But when I was done there were no assurances provided and no questions. I was left thinking that the Legislature in this state will indeed often find the money to undo some of the most egregious damage caused by the administration in care for our most vulnerable residents. But it is essentially a Band-Aid solution. The Legislature appears less interested in addressing or questioning the overall policy this state has been following of cutting and privatizing vital human services.